Hello! Pier and I haven’t posted on this blog for awhile because, sadly, we haven’t travelled anywhere. We’ve both been busy and broke building new careers. 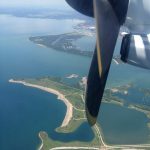 But we decided it was high time for a trip, though it’d have to be cheap. 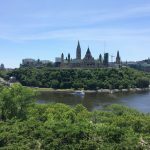 So we gathered up our Aeroplan points to cover a hotel, bought Economy VIA Rail tickets, and off we went to Ottawa! 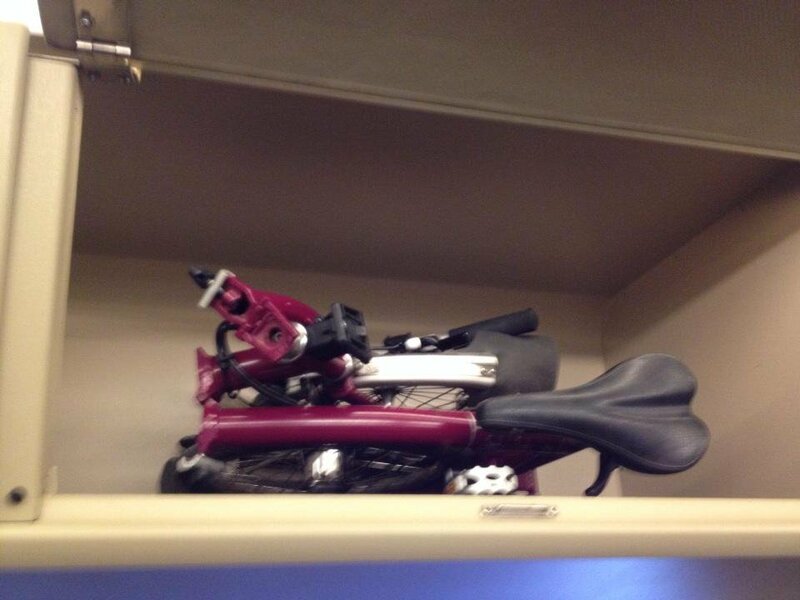 Bringing the Bromptons on VIA Rail is easy. We didn’t even need to put them in their travel bags. Just fold and store. 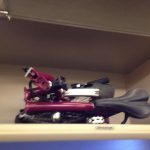 Some of the trains have giant overhead compartments that fit a folded Brompton, but we had an older train that didn’t and just left the bikes in the luggage area. Four blissfully relaxing hours later, we were in Ottawa! I wish I’d taken pictures biking out of the train station, but you know how it is when you arrive somewhere – you just want to get to where you’re going. Besides, the Ottawa train station isn’t very picturesque. It’s a plain building amidst two major highways, in the kind of area that, if this were Toronto, would be unsafe to cycle away from because of the dangerously fast roads and the lack of cycling infrastructure. 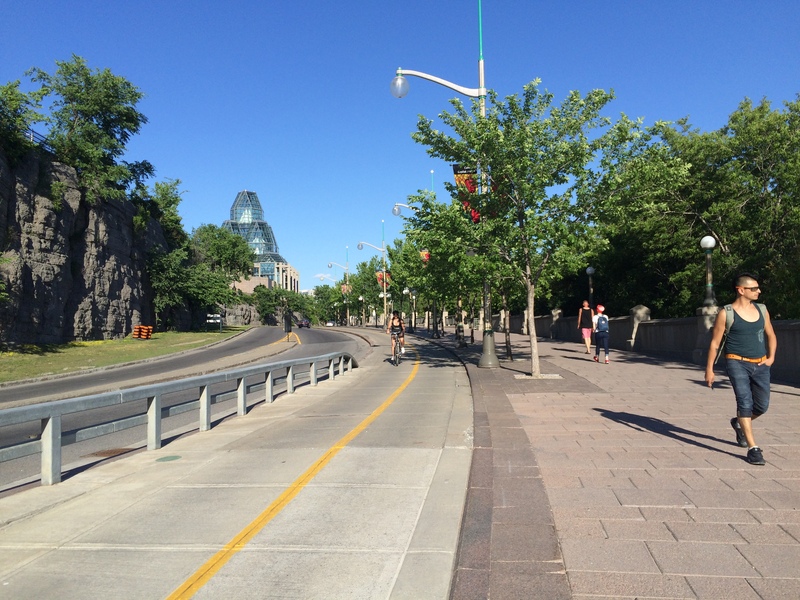 But this is not Toronto, it is Ottawa, where even in an industrial suburban area of the city there are… BIKE PATHS! And tons of them! Check out the map below. All those grey squiggly lines are paved bike paths with clearly marked signs that travel through green space around and over the Rideau River and into Ottawa’s city centre. Yay! Ottawa Train Station on the east side of map. We were heading west over the Rideau River. We arrived at our hotel in Centretown in a mere 15 minutes, and less than 5 of those minutes were biking on streets with cars. What was even crazier is that we arrived on a Friday afternoon in what should have been rush hour… and there really wasn’t much traffic. Does everyone get off work early on summer days in Ottawa? 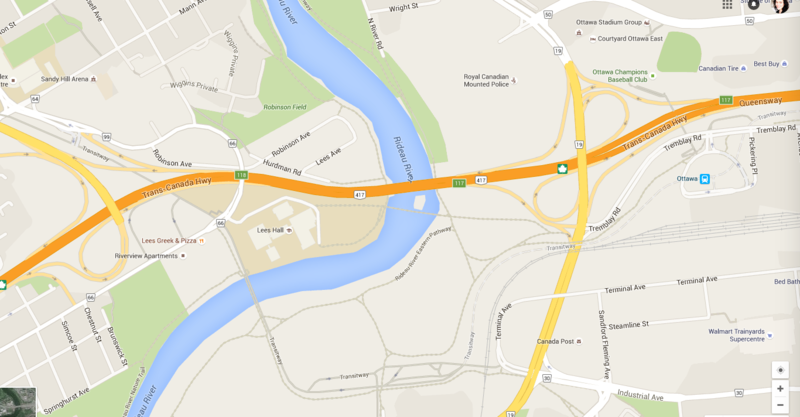 Or is traffic in Ottawa just really tame compared to Toronto? Could be a bit of both. The Ottawa River. No hand railings! You could just ride right into the river if you wanted. The Alexandra Bridge, Ottawa side looking towards Gatineau. 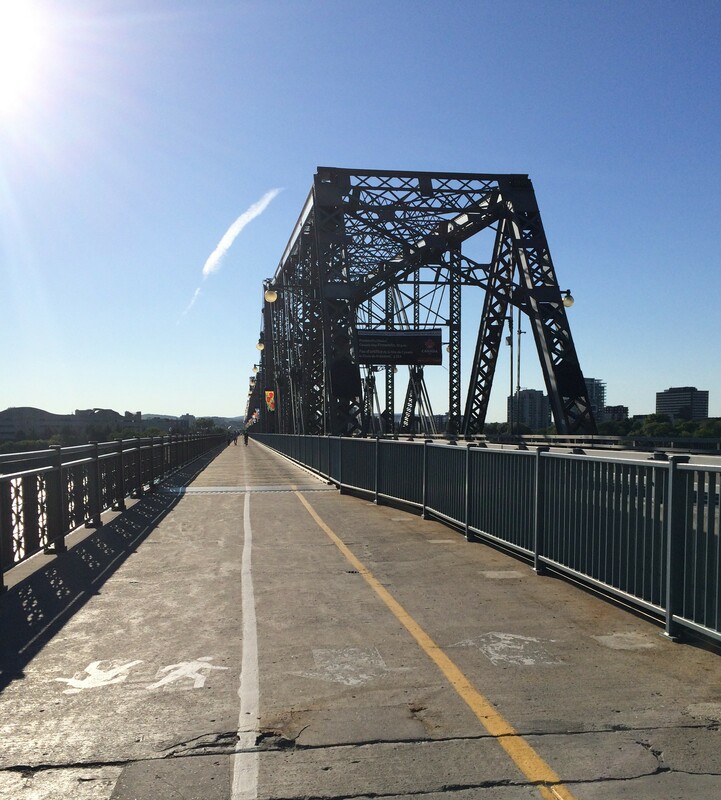 Bike lanes and pedestrian walkway on the Alexandra Bridge – totally separated from motor vehicle traffic! Bike lanes along Sussex Dr look like they used to be the sidewalk, but with a nice cobblestone promenade for the pedestrians, the concrete sidewalk is now for bikes. 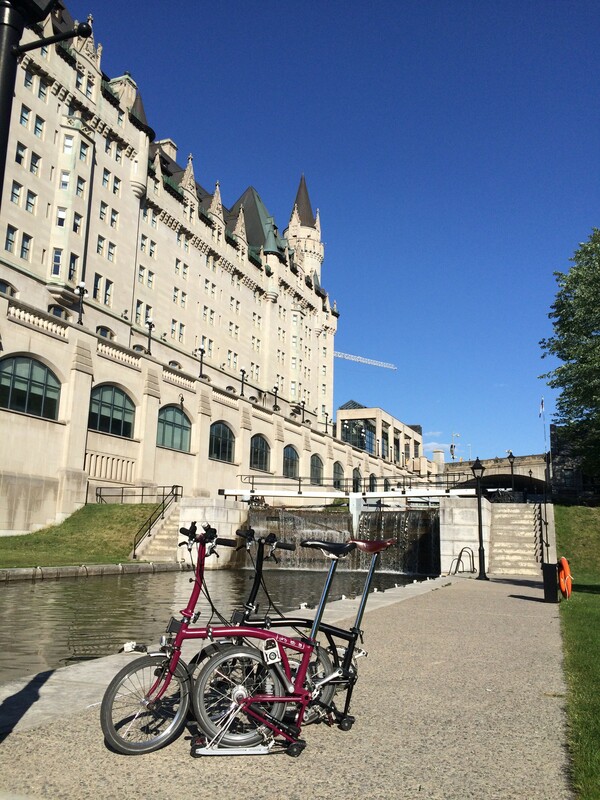 We find the bike path along the west side of the Ottawa Canal. There is a path on the east side too. After dinner, we decided to explore Ottawa on a Friday night, and found that the streets were pretty empty. Had everyone escaped to the cottage? 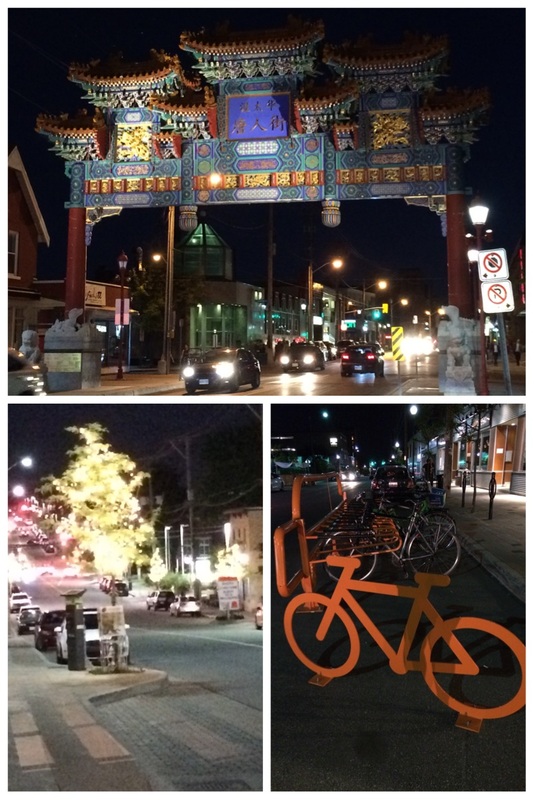 We headed down Somerset St. through Chinatown, Little Italy and Hintonburg. 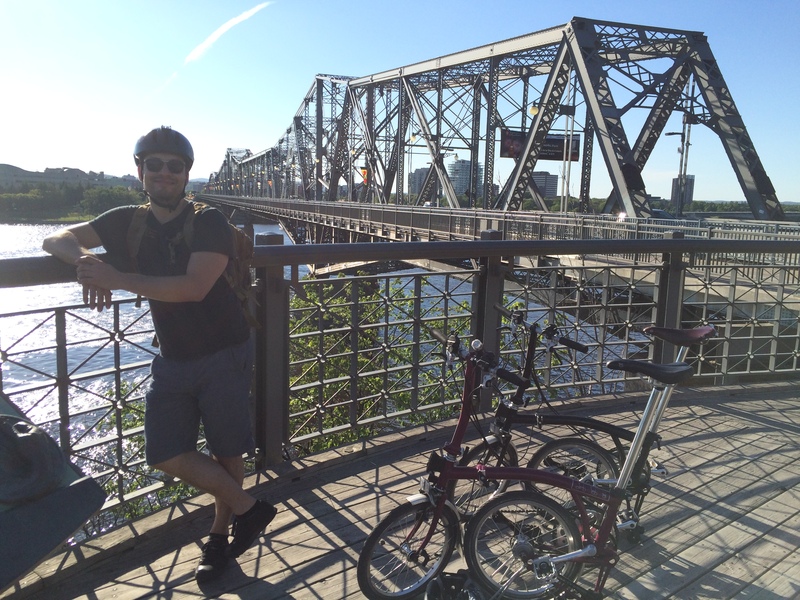 Right beside the bike corral in Hintonburg, a woman stopped to ask us about our Bromptons. This happened a lot over the weekend. 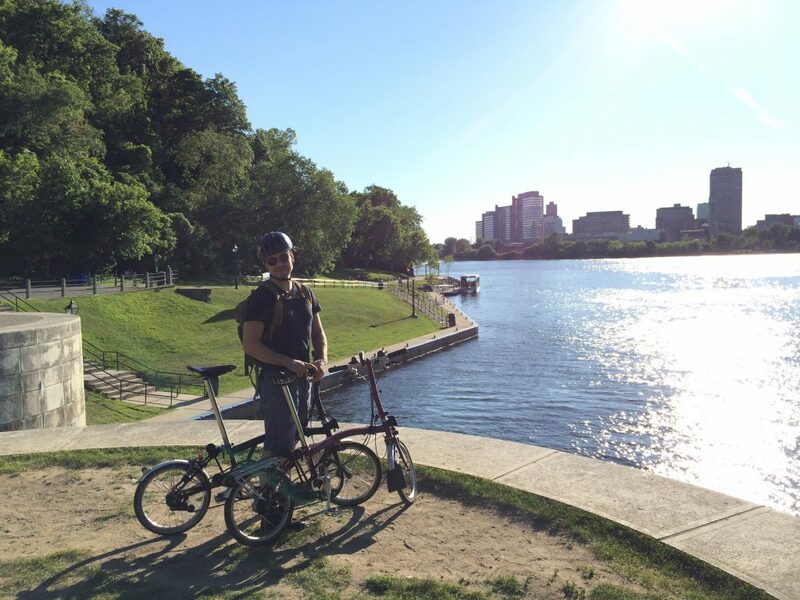 Most everyone we met in Ottawa had never seen a Brompton, and there were many turning heads and pointing fingers. The woman in Hintonburg even asked if she could record a video of me folding and unfolding it. The Brommies haven’t attracted this much attention since we were in Cuba! 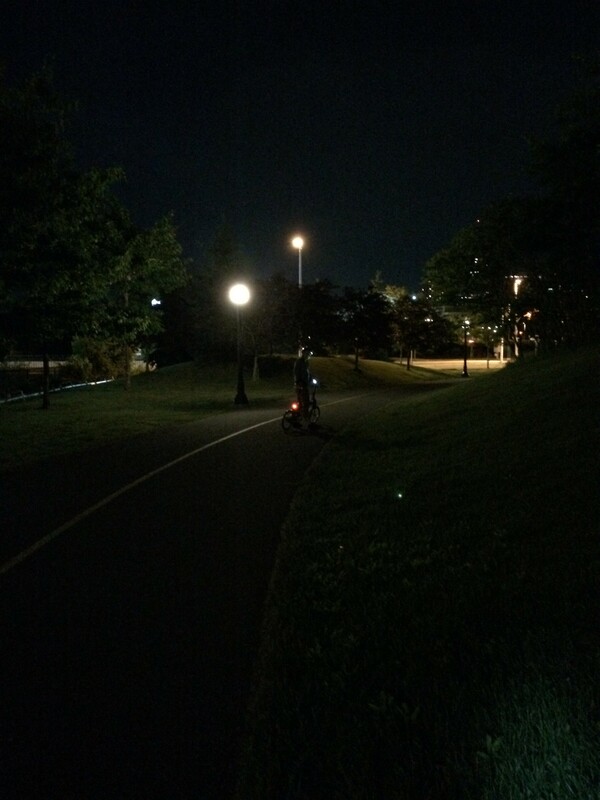 Back downtown, we finally found out where most Ottawans were that night – Glowfit. 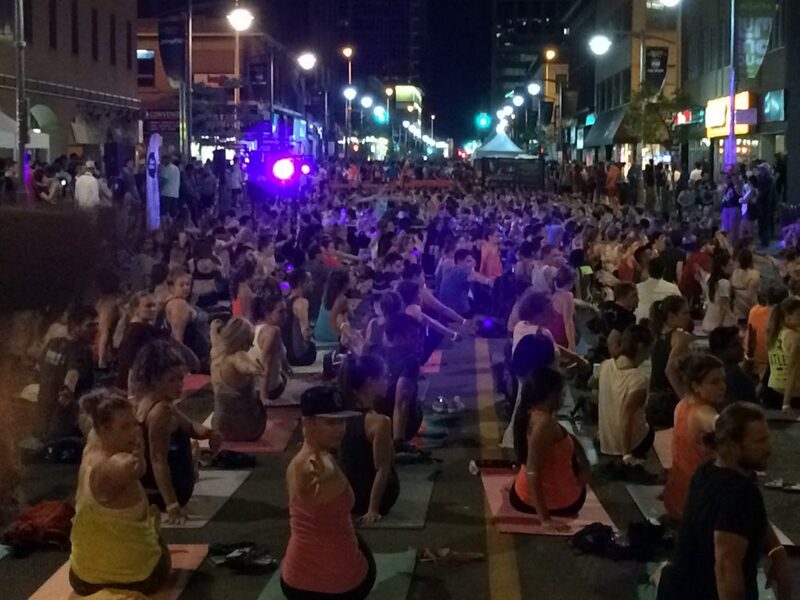 Yes, that is yoga in the street, and everyone is wearing glowsticks. 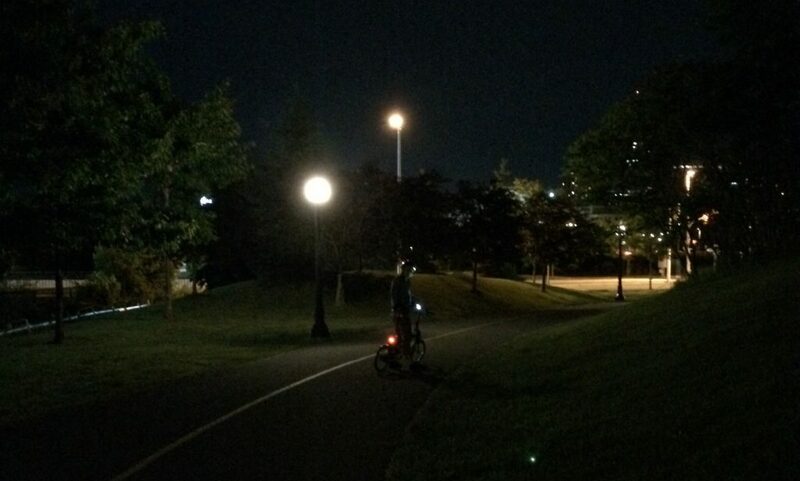 Next up, forgotten bike lock keys, Parliament Hill and cycling along the Rideau River and Ottawa Canal.